In Britain, ‘vermin’ are rats, mice, maybe squirrels – in Africa they’re a bit bigger and come in the shape of the baboon, an intelligent primate that can be nearly three feet tall and up to 100 pounds in weight. This is regarded as humankind’s closest brother that is capable of a lot of things including reasoning and learning. They exhibit complex behavioural attributes that closely parallels that of human beings. In as much as you may already know a lot about other African animals, there are a lot of baboon facts below that tunes your mind to the complexity of this animal and how nature supports it. If one of these tries to steal your lunch, fighting back is not a good idea! Here’s a selection of 20 interesting facts about baboons. 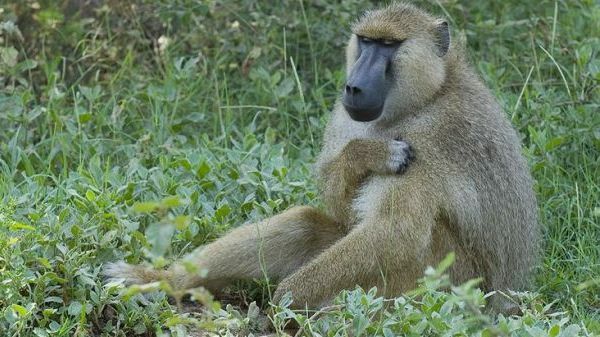 1 – There are five species of baboon in Africa; the two most seen are the colourfully-named Olive Baboon, Papiocynocephalus Anubis, and Yellow Baboon, P. Cynocephalus. The other three species are the Hamadryas, P. Hamadryas, the Chacma, P. Ursinus, and the Guinea, P. Papio. 2 – “Nyani” (‘baboons’ in Swahili) are found throughout most of the African continent, but generally in different areas; the Guinea is only found in and near Guinea on the northwestern coast, the Hamadryas only on the far northeastern edge and the bottom of the Arabian peninsula, and between the two the Olive is found from Mali to Tanzania. The Yellow is in the next section down, between Kenya and Botswana and the Chacma occupies most of the southern part of the continent. 3 – The Olive baboon has a strange quirk to its tail – it looks permanently broken. The animal carries the first quarter or so straight up from its rump, then allows the remainder to fall limply, giving this impression – but it’s not true, don’t worry! 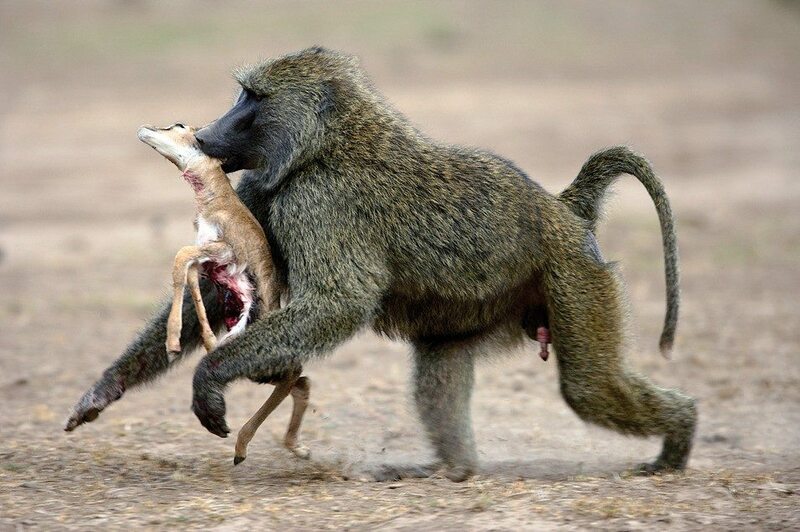 4 – Female baboons are often quite a bit smaller than males, and lack the ruff of long hair around the neck that characterizes the mature male. 5 – Because of its relatively small range and the loss of its habitat, the Guinea baboon is classified with a conservation status of ‘Near Threatened’, but all the others are of ‘Least Concern’. 6- Baboons live in a surprisingly wide variety of habitats, basically not really caring where they are as long as they have a water source and something like tall trees or caves on a cliff face where they can sleep safely. 7 – In fact, even the water source can be optional, since they can survive for a quite a while by licking their fur clean of overnight condensation, although by preference they will drink properly every other day or so. 8 – A troop will have a definite territory that it will wander and forage within, but the edges seem to be a bit fuzzy and often overlap those of other troops. However, they avoid confrontation by simply staying away from each other. 9 – Baboons can eat pretty much anything, being omnivorous, but they are selective about what they eat. Their diet can include anything from grass, berries and roots to insects, shellfish and even small mammals and birds. 10. Baboons are extremely crafty, very intelligent and most adaptable as well, part of the reason they are considered by the natives to be pests and ‘vermin’ rather than the ‘wildlife’ foreigners tend to see. 11 – Most days, baboons rise by about 8 a.m, have a good mutual grooming session while the kids play, then set off in columns to start looking for food. They can walk around six miles a day in this way, split either side of a siesta during the hottest part of the day. 12 – While walking, the troop settles into a protective order, with the dominant males leading the way, the females and young in the middle and the inferior males bringing up the rear. 13 – By the evening they will be back at their sleeping sites and after another session of mutual grooming, which helps the members of the troop bond as well as keeping them clean, they settle down for the night. Definitely creatures of habit. 15 – A baboon pregnancy lasts about six months, and for the first few weeks after delivery, the mother carries the infant everywhere with her, holding it to her stomach with one hand as she travels. 16 – After about six weeks the baby can ride on her back and hold itself on by all four limbs, then it will begin to sit up and ride like a jockey. Once it is around five months or so it spends more time with the other youngsters than with its mother. 17 – As the youngsters grow up, females simply become adults in their own troop, while males move away to look for another troop to join. They do this usually by making friends with some of the new troop’s females, perhaps defending them and their young, and gradually getting accepted that way. 18 – The baboons’ main predator is, of course, we humans. However, they learned pretty quickly that humans can still kill or injure them when they are trying to escape in the trees, so if we’re the problem they run away through the undergrowth instead. 20 – Despite their lack of a spoken language as we understand it, baboons do use a range of around thirty sounds such as screams, grunts and barks. They also use non-vocal indications that include yawning, shrugging their shoulders and smacking their lips. It seems they get their message across one way or another!